I was very disappointed when our cool (original) Double Pocket Die retired but then excited when we came out with a new Double Pocket Die set that had so many more options! In order to find this cool die I had to search for it and I had to search for the extra Pocket Trims Die Set so I don't know where they are without searching. I made this to use as a give-away at my Open House on Friday. I used some retired print paper as I have oh so much! The pocket topper trims are die cut from Lemon Drop and Blue Lagoon card stocks. 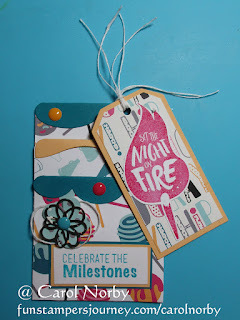 Here you can see the tag I made using the largest tag on the Tag Set Steel Rule Die. 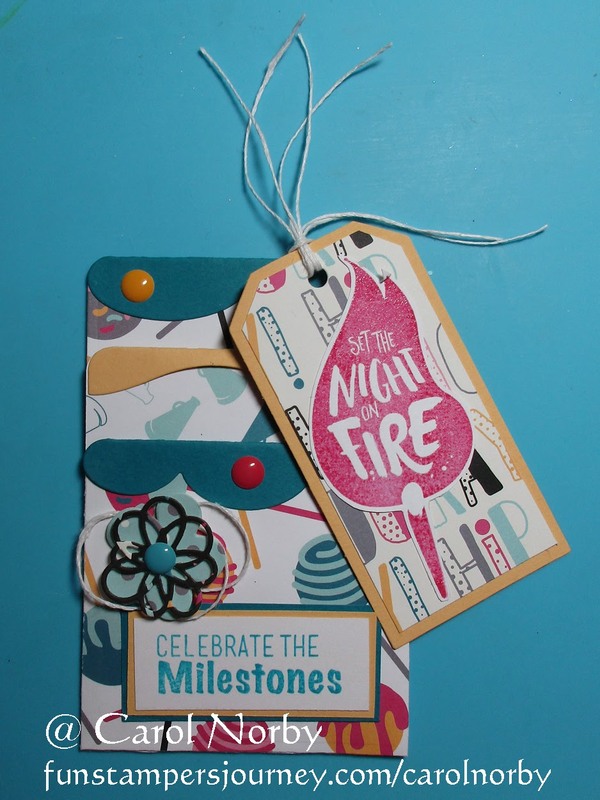 I stamped the Flame from the Birthday Bash stamp set (can get as a Bundle but I don't have the die set) using Sweet Berry ink. 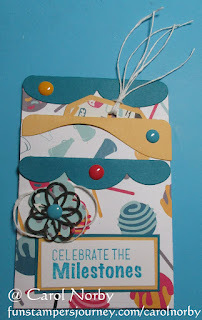 The text is from the Word Up stamp set stamped with Blue Lagoon ink on Whip Cream card stock. 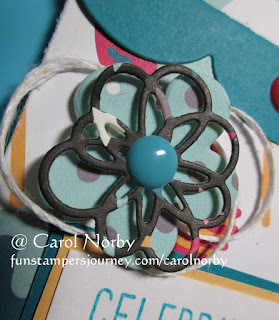 The flower was made from some more printed paper from the retired paper pack and Blooming Details Die set. A bit of Whip Cream Thread behind it and some cool Sweet Candy Drops to add some pop. I hope I get some customers at my open house. I've taken flyers to the store where I sell my cards and took some flyers to the store where I'll be holding my event along with emailing my customers.